Charming Charlie sent me a gift card to shop their site and my immediate reaction was, "Challenge accepted!" I have a few clothing pieces from Charming Charlie that I love, and I hadn't sifted through their apparel in awhile, so that was my first stop. I started with sweaters, then tops, then moved to jackets. That's when I found this adorable number! It's olive, it's a bomber, and it's embroidered. Win, win, and win! What's not to love about it? It arrived last week, so I decided to wear it over the weekend for a quick-ish meet up with Jenna. I went ahead and sized down to an extra small and I am very happy with the fit! I will say that I wore my green anorak jacket over this outfit. The bomber is really just shirt-weight, and since it was in the 40s, I definitely needed an outer layer. I could have used a blanket scarf, too, because the wind made it feel even more frigid! The floral embroidery makes this even more special. It's a good transitional piece for fall, but the colors will work just as well, if not better, in the spring, too! 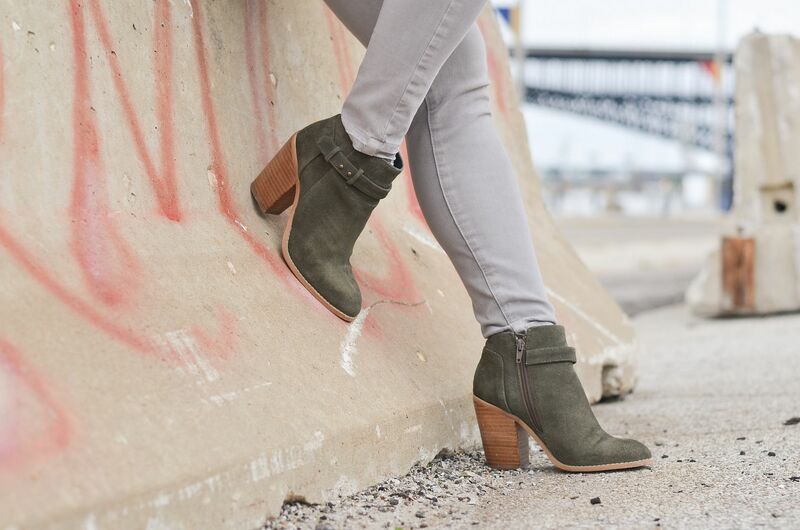 I decided to go matchy-matchy with the olive booties, but I did also try this on with my grey over the knee boots and loved the way that looked as well! I should have taken a selfie so you could see that option. We met Jenna and her hubby downtown for lunch. Shake Shack is my favorite fast casual burger place, hands down. I will even say that In-n-Out doesn't even come close to my love for Shake Shack. The burger is juicy, the bread is buttery soft, and the fries are the best mix of crispy on the outside and chewy on the inside with the perfect amount of salty goodness. I am salivating as I type this. Well, Shake Shack has been teasing us with a St. Louis location for a couple of years now, but it's been a long time coming. On Saturday, a local Italian restaurant called Porano teamed up with Shake Shack by letting burger and fry fanatics take over their space for a one-day pop-up. I think this was their way to commiserate with us that it's taking forever and help tide us over until they actually do open! It ended up being about an hour and 20 minutes to place your order and then another 20 minutes after that to wait for your food. They only had two of their burgers available - the Shackburger (basic cheeseburger) and their mushroom burger. Instead of shakes, they offered a custard dessert - basically an ice cream sandwich but with custard instead. Unfortunately, they were out of the dessert by the time we made it to the register at almost 2:30pm (the event started at 11am and ended at 3:30pm.) It looked amazing though! I was worried the food wouldn't be as good as the real thing, but it was definitely exactly as good as the real thing. I regretted not ordering a second burger! Seriously so good! 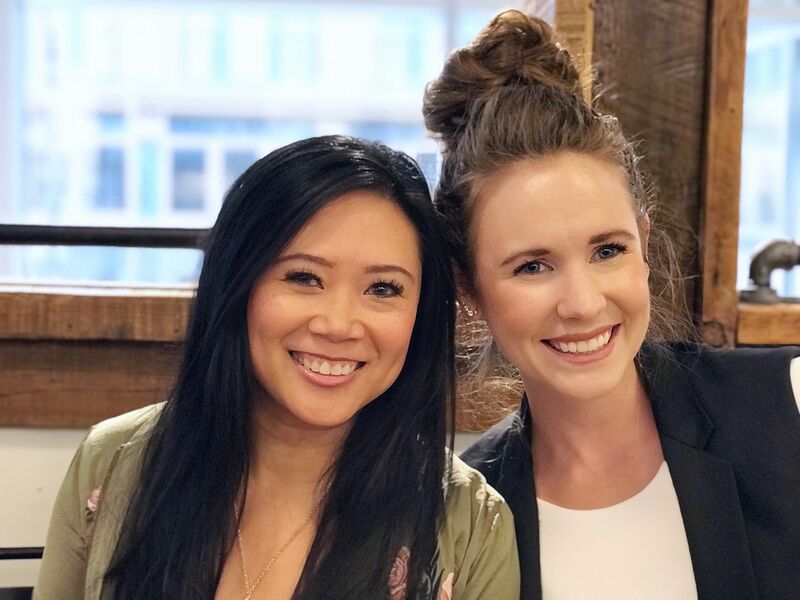 We ended up bringing our husbands with us on this meet-up, which I think was therapy for them as they exchanged their husbands-of-bloggers stories. It was pretty entertaining to hear their banter and photographer struggles. Haha! So, just a quick heads up about my schedule. I know I've been so sporadic with you guys lately, and trust me, it's not really by choice or because I don't *want* to blog. It's really for my own sanity and choosing to control the things I can control like my blogging schedule. I should rephrase that - it's choosing to let go of the things I can let go. Obviously I can't let go of work. Work is work. And since I am two weeks away from my Pilates certification final exam, I could really use my free time on the weekends to focus on Pilates and get myself ready. Unfortunately, that leaves blogging as the one thing I am able to cut and have to temporarily let go. 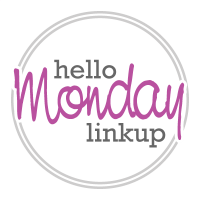 My posts today and the next two Mondays will be the only posts for the next couple of weeks. Then I should be back at my normal blogging schedule starting the week of the 20th. I know that seems like a hella long time from now, and if I land on some extra time, I certainly will blog, but for now, I don't want to overcommit. 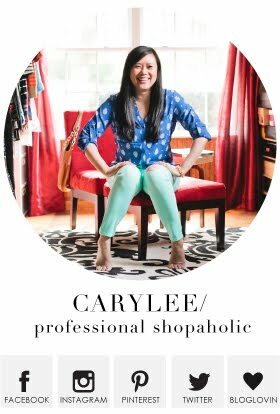 You can always catch my daily outfits in real time on Snapchat (@carylee07) and because I'll be laying off the blog for a bit, I will go ahead and also post those daily selfies on my IG stories as well (@morepiecesofme). Wish me luck as I enter my final two weeks!!! I can't believe it's here. So excited for you to be on the homestretch of your pilates certification! I've had some good luck with Charming Charlie clothes and this jacket is obviously a hit. Great choice! This bomber is so cute, I got a cute dress with my gift card that I cannot wait to wear. You are so close to get your pilates certification, yes focus on that for now blogging can wait. Love the bomber! Shake Shack is so yummy. Good luck on your certifications and thanks for the link up! 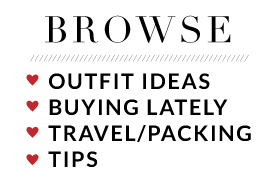 Isn't funny how we push ourselves to stick to our blogging schedules? Take that break you need! We will still be here! That bomber is gorgeous and I am loving the booties. 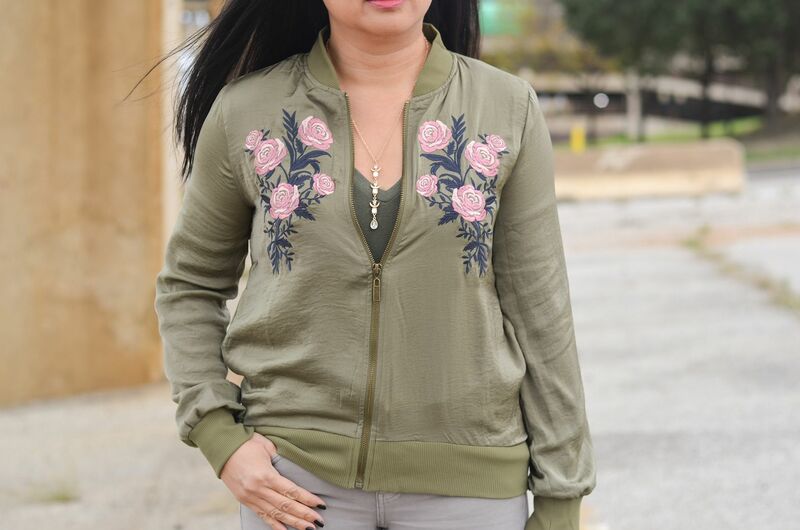 I have an olive floral embroidered bomber from last year that I think I have only worn once. I need to style it more often, I think! That bomber is so perfect!!!! This is such a pretty bomber! I love the embroidered detailing. Good luck with your pilates certification! So exciting! Such a fun jacket! I love it with the olive boots. Cute look, but more importantly...GOOD LUCK with the certification!! Sometimes you just have to step away for a bit and that's ok. We all have to do it. I just did a pilates workout on Friday for the first time in ages. I need to incorporate more of that into my workout routine. Have a great couple of weeks! Big fan of olive, so I love your outfit. What a cute jacket, love the pink roses. 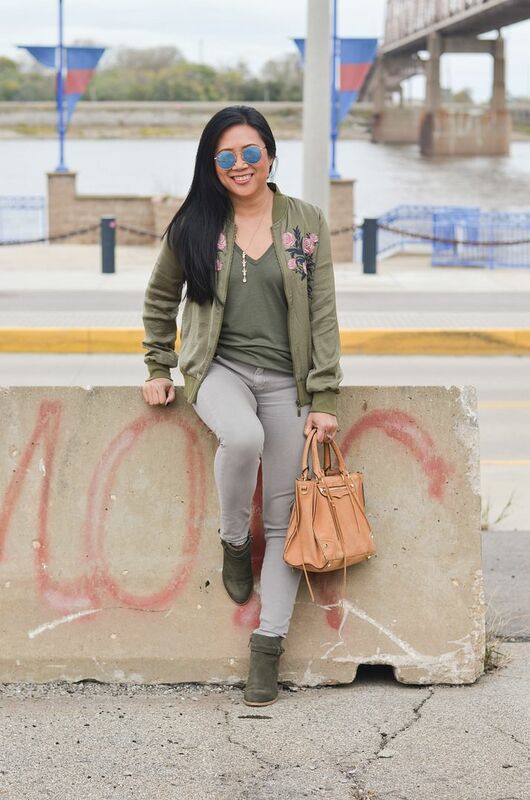 Olive and grey is such a classic fall pairing, and this bomber is such a great new piece! Good luck on your pilates final exam, I'm sure you'll do great! Lovely jacket, you chose well! Good luck with your pilates exams! These neutral colors are so pretty! 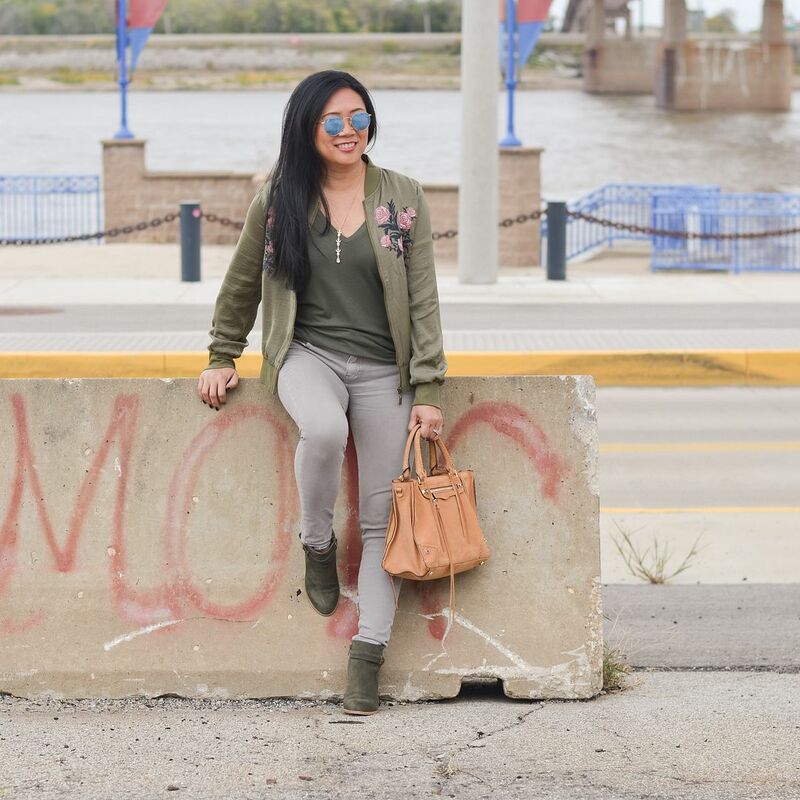 Perfect fall style!